98 gold lode clams approximately 1800 acres. Weaver Mining District, Northern Black Mountain area of Mohave County, Arizona, USA. Numerous pre-existing roads. Over 4400 ft of 12ft. wide roads. Access roads to all claims. The area has had five major volcanic upheavals over billions of years, the water level is at least 700 ft below surface resulting in low levels of erosion. Deposits bear evidence of having been formed rather close to the surface. This is a past, proven, gold-producing area. In 1850's processing was done by specific gravity separation. Historic remains of one of two "stamp mills" is still visible. Assessment work has been performed by and kept current since 1980 providing for "real property mineral rights" All claims are up to date and fees are paid. Seller may consider selling individual claims. The Kemple Camp Mine is not available at this time. Located just outside of Amarillo, Texas, USA. 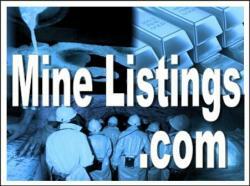 The largest deposit of high-grade silica in the western U.S. for sale. Owner has 60 claims on Indian River and Quartz Creek, located outside of Dawson City, 104 claims in total. Good roads with easy accessibility to claims. The Ten Sleep Gypsum mine is the largest high purity gypsum resource in North America, estimated at slightly more than one billion tons, on five mining claim groups. The claims total almost 17,000 acres of which 9,725 acres are underlain with gypsum. These gypsum deposits are secured by 108 association mining claims. Located in California, USA. Approximately 80 acres of patented land and several unpatented claims. Previously producing gold mine. Fully permitted, recently producing California gold mine in the historically highest gold producing county in California. The 400 acre patented property was partially hydraulically mined through the late 1800’s with estimated production of 200,000 ounces. This offering represents an exceptional opportunity to take over an existing alluvial gold mining operation and begin mining proven reserves immediately. Numerous prospective areas remain unexplored on this 202-hectare permit, offering significant exploration upside. Located in White Gold District of the Tintina Gold Belt, Yukon Canada between two producing placer mines directly to the north and south. 20 kilometers from Thistle Creek Landing, Thistle Creek has produced 60,000 Au ounces since 1976. Gold Mine For Sale. Located in Colorado, USA. Hard Rock Mine with projected Total Probable and Possible Gold and Silver deposits worth almost $1.2 billion. Located in Idaho, USA. Proven reserves of 50 million tons. High grade gold and platinum group elements. Arizona BLM 112 Placer Claims For Sale, 3 Excellent Geo Reports, Audited By Geo Professional Third Party! 112 BLM Placer Claims located in the Florence Valley, Pinal Co., AZ is world renowned for its geological mineralization. The location is remarkably easy being about 45 minutes NW of Tucson, AZ and easily accessible by car. The land is flat and easily developed. The 3 geological reports are impressive to say the least! The potential output of the Grandview mine is truly astounding. 20 Lode Mining and One Mill Site claims near the end of the Oregon Trail with all permits and required government filings current. Approved and completed mine tunnels, plans and access routes. Adequate water supply and paved state road nearby. New power lines within five miles and temperate climate with ability to operate year-round next to a major city only seven away. Located in Pinal County, Arizona, USA. Over $40,000 in metal found in 11+ acre from surface to 6′ deep. Flat, easy to access. BLM Claims. Previously Producing Patented Gold Mine for Sale in the USA. $1.6 Billion Estimated & Inferred Resources including 80,000 tons in Mill Tailings. Developed Project with 4 adit tunnels. 1,274,320 Gold ounces estimated. Estimated Monthly NOI of $6.3 Million based on 400 ton/day operation. Private Land. Gold & Silver. Extensive documentation available. This Claim is near Walker Lake Nevada. Access is directly off of 95, to dirt roads which are in good shape at the time of us being there. A normal mid size SUV was able to pass without incident. At the Claim there is area adequate to stage and room for a few vehicles to pass. Located in Yukon, Canada. Proven Placer claim priced to sell. 2.21 Miles square is the size of the property.